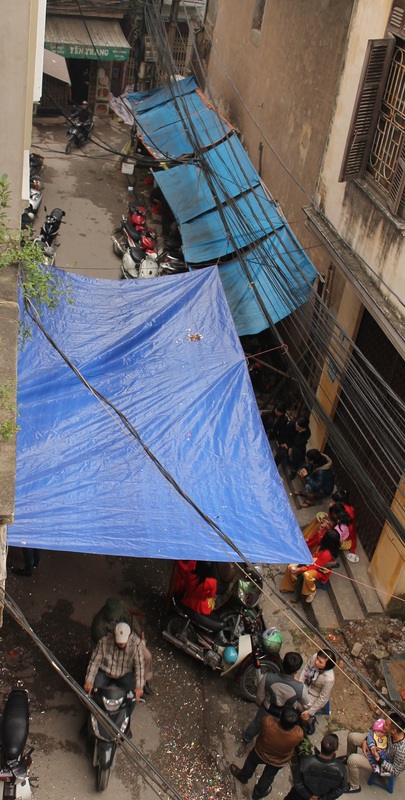 I thought somethin’ was up…..
…..when I left for work this morning ~ there was a big tarp hanging over the street (alley, actually). I figured my neighbors were having a party and when I got home from work…. …… sure ‘nuf….there’s a party goin’ on! This happens a lot here. 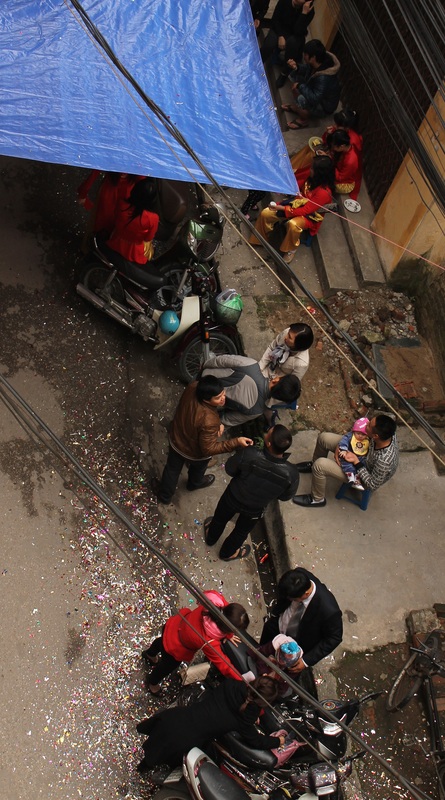 A party is happening right in the middle of the street with motorbikes running right through it the whole time! I’m thinking this one is a wedding ~ the men are all in formal dress and the women are wearing ao dai’s (pronounced ‘ow zai’ ~ yes, I know it’s a ‘d’, but you pronounce it like a ‘z’, silly! Anyway, I also want to add that last night I attended the Asian premiere of the recently re-mastered film Lawrence of Arabia. I’ve seen bits and pieces of it a million times over the years, but have never seen the movie in its entirety ’til last night. Wow, a really great film in a really great venue. I’ll be going back to that theatre (Ha Noi Cinematheque) for sure and will take pictures. The theatre itself is nothing remarkable, really, but the courtyard outside it is very nice. Pictures to follow….